The topic for Saturday, September 19th will be a K12 Online Conference preview with the Conference Organizers. Since 2006, K-12 Online has hosted a free, all-volunteer online conference with 40+ free videos each year featuring some of the most creative and innovative educators sharing their best ideas for engaging students with digital tools and effective learning strategies. Don Wettrick and his #Innovation students will kick off our 2015 conference with a pre-conference keynote on Monday, October 12th. For two weeks, starting on October 19th, 40 presentations will be published in four different strands, with four presentations posted per day. All K-12 Online presentations are published as pre-recorded videos, generally no longer than 20 minutes in length. You can view the recordings any time/any place once they are published and can also subscribe to them on your mobile device in iTunesU. 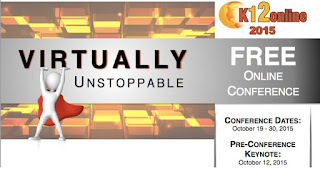 2015 Conference Theme: “Virtually Unstoppable"
More information and session details are at http://live.classroom20.com. If you're new to the Classroom 2.0 LIVE! show you might want to spend a few minutes viewing the screencast on the homepage to learn how we use Blackboard Collaborate, and navigate the site. Each show begins at 12pm Eastern (GMT-5) and may be accessed in Blackboard Collaborate directly using the following Classroom 2.0 LIVE! link at http://tinyurl.com/cr20live. All webinars are closed captioned. On the Classroom 2.0 LIVE! site (http://live.classroom20.com) you'll find the recordings and Livebinder from our recent “Matt Miller-Featured Teacher” session with our special guest Matt Miller. Click on the Archives and Resources tab.